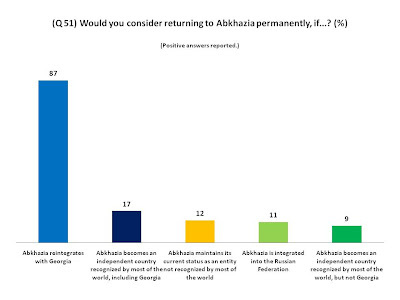 The research targeted IDPs displaced from Abkhazia as a result of the 1992-1993 conflict and focused on attitudes towards return, conflict resolution and justice. It included a large representative survey of IDPs currently living in collective centers, and focus groups with IDPs in private accommodation. On March 15, 2011, Magdalena Frichova from CR together with CRRC presented the results of the survey at the EU delegation in Georgia. In addition to EU representatives, the audience consisted of ambassadors, representatives of the Georgian government and several international NGOs. The presentation sparked a lively debate especially about the conditions under which IDPs would be able and willing to return to Abkhazia. The audience expressed interest in further analysis of the data that are now available for the public. The participants also pointed out the need for more evidence based research to serve as a basis for future policies on conflict resolution in Georgia. The results were also presented to civil society representatives in Abkhazia. 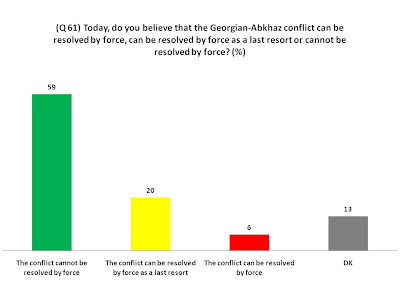 In particular, the Abkhaz audience was surprised to see that the percentage of IDPs who support the use of force to solve the Georgian-Abkhaz conflict is very small (6% say the conflict can be resolved by force, and an additional 20% say it can be resolved by force as a last resort). At a presentation for Georgian NGOs on March 14, the debate focused mainly on IDPs’ dwellings back in Abkhazia and the fact that the majority of IDPs would face problems with regard to housing if return were made possible today. This is because most IDP dwellings have either been destroyed or are now being occupied by others (approximately 75% in total). The overall purpose of the project was to inform future policies on IDPs and displacement, as well as to specifically provide a starting-point for an objective debate. CR has produced an analytical report that is now available from their website, together with frequency tables and slides. The dataset and the methodology and fieldwork report are available upon request from CRRC - Georgia. Based on the survey results, CR will also produce a discussion package including policy recommendations that will be addressed to the international community and to the Georgian authorities. Keep your eyes open at the CR website and here at the blog – more material from the research coming soon!